The October 2017 Chemist board exam top 10 or topnotchers together with other results - list of passers, top performing schools and performance of schools are out online on Wednesday, October 18 or in 2 working days after the exam. Gio Ferson Maliksi Bautista, University of the Philippines - Los Baños (UPLB) alum, aced the board with 93.00%. It was followed by John Noel Ratilla Maape, also from UPLB, garnering 91.25%. 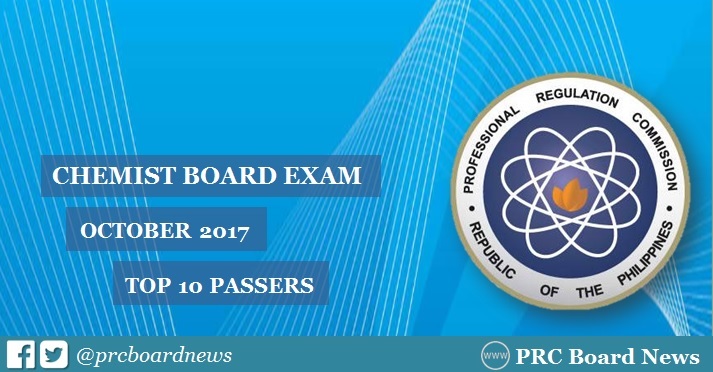 The Professional Regulation Commission (PRC) administered the licensure exam in the cities of Manila, Cagayan de Oro and Cebu on October 10 and 11, 2017. In the October 2016 Chemist board exam, Mikel Jason de Guzman Allas from the De La Salle University (DLSU) - Manila aced the board with 93.50%. It was followed by Jerrica Dominique Navarro Gazmen from University of the Philippines - Manila (UPM) with 92.00%. Meanwhile, UPM alum Abdul-Rashid Batara Sampaco III led the passers in the September 2015 licensure exam, 92.25%. Ateneo de Manila University (ADMU) graduate Patrick James Borromeo Cruz and UPM's Gabriel Luis Limpo Neri were the second placers with 91.25%. Here's overview of topnotchers for Chemist board exam in the past four (4) years. The Malacañang Palace announced the suspension of government work on October 16 and 17 due to nationwide transport strike. With this, results may be released on later date, possible on the following day.